I am an Assistant Professor of Computer Science at the University of Alabama. I direct the Human-Technology Interaction Lab. My work focuses on Brain-Computer Interfaces (BCI) and Human-Robot Interaction (HRI). My goal is to leverage novel neurophysiological sensing technologies, software engineering, and robotics to create tools and applications that support the exploration of Brain-Robot Interaction (BRI). 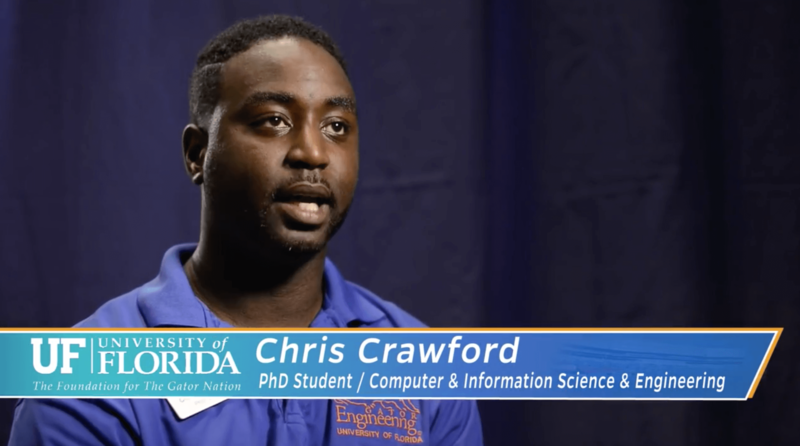 I use a combination of Human-Computer Interaction (HCI) and BCI research to investigate how users interact with systems capable of adapting to their cognitive state. This research investigates ways to utilize Visual Programming Languages (VPLs) with neurophysiological measurements of electroencephalography (EEG) signals acquired with a Brain-Computer Interface (BCI). This data can be used to understand cognitive and affective states such as fatigue, cognitive workload, engagement, attention, and frustration. 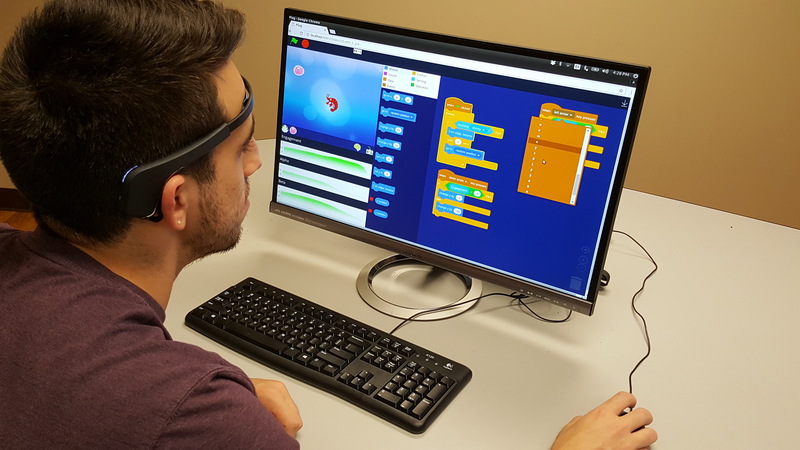 This work features a block-based programming environment capable of analyzing (near) real-time electroencephalography (EEG) data that enables users to quickly develop neurofeedback applications. 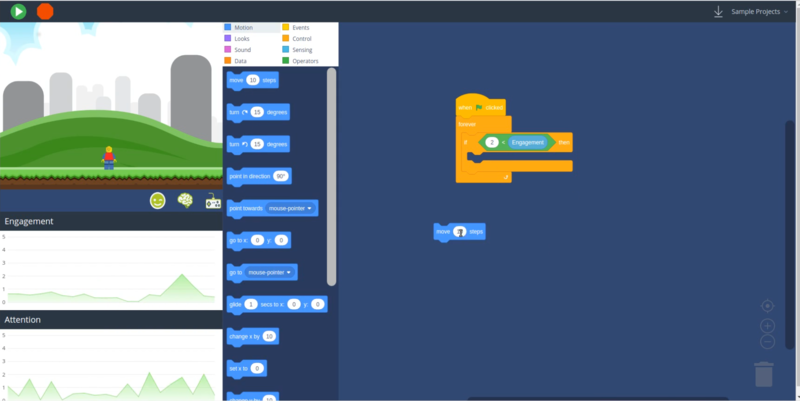 See 'Brain-Computer Interface for Novice Programmers' (SIGCSE 18') for more information. The Brain-Drone Race is a competition featuring users' cognitive ability and mental endurance. During this event competitors are required to out-focus opponents in a drone drag race fueled by electrical signals emitted from the brain. 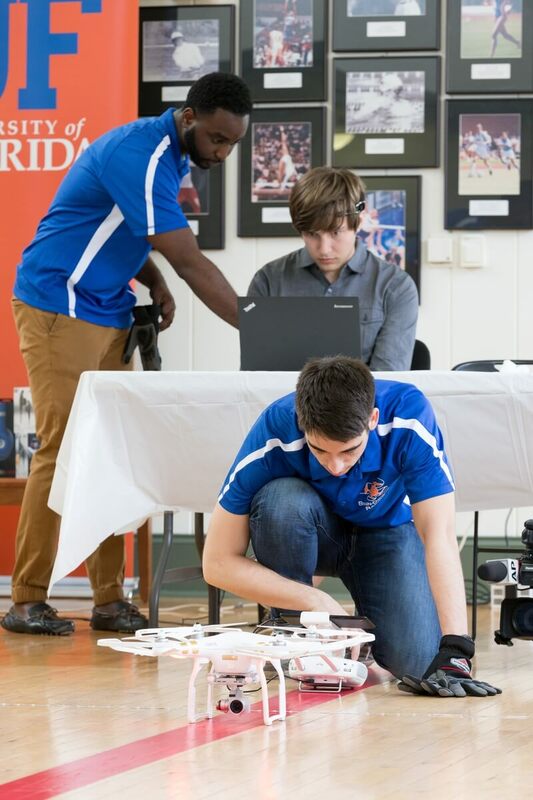 On April 16, 2016, 16 participants competed using the Emotiv insight headsets and DJI Phantom 2 drones. Although others had previously demonstrated drone manipulation via EEG, this was the first public demonstration of a competitive Brain-Drone event. 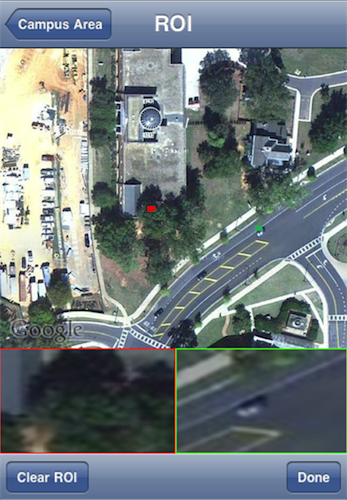 For more information visit www.braindronerace.com. This work investigates a method of detecting tongue protrusion gestures by utilizing the tongue's color and texture characteristics. 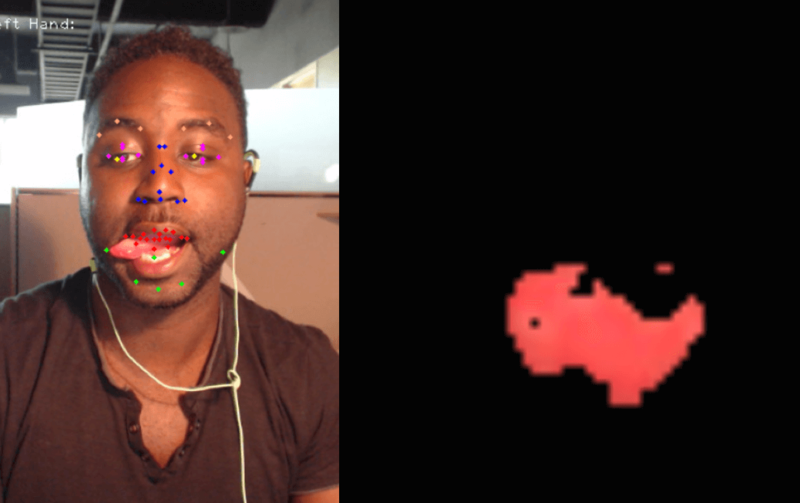 By taking advantage of recent advances in computer vision, real-time tongue gesture detection is possible with video streams provided by a standard web camera. Tongue gesture detection functionality has the potential to supplement user interaction and provide for an immersive experience in applications such as games or video communication applications. It could also aid communication for mobility-impaired users. See 'Using Cr-Y Components to Detect Tongue Protrusion Gestures ' for a description of a process presented at the 33rd Annual ACM Conference on Human Factors in Computing Systems (CHI 15') that uses YCbCr color space manipulation and a support vector machine to detect left, right, and downward tongue protrusions in real-time. Many members of the armed services are overseas during elections. As a result, they are unable to cast their ballot in person. Although the Uniformed and Overseas Citizens Absentee Voting Act (UOCAVA) gives soldiers located overseas the right to mail in absentee ballots, they are often left uncounted due to issues with shipping. This research investigates Televoting, an approach to Internet voting (E-Voting) modeled after Telemedicine systems that utilizes video communication technology. Televoting attempts to address security issues that have plagued previous E-Voting platforms by producing a paper ballot instead of storing votes on a server. 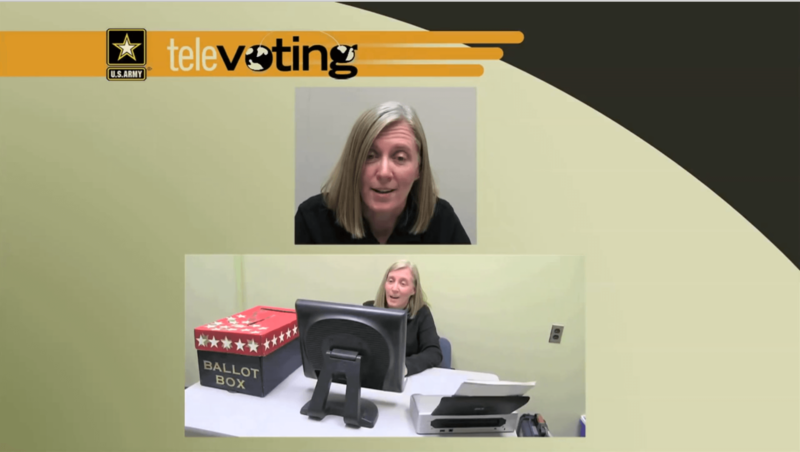 See 'Televoting: Secure, Overseas Voting' for a discussion of the system design and the voting process users experience when using Televoting. Unmanned robotic systems are being used in the military for surveillance and reconnaissance missions. However, current systems utilize a one (or multiple) operator/one robot interface. In addition, human-in-the-loop models or systems that have an autonomy component create issues because human operators tend to intervene more frequently if their expectations of the autonomy are not met. This research investigates the impact spatial and temporal cues have on operators' trust in human-multi-robot systems. See 'Affecting operator trust in intelligent multirobot surveillance systems' for a discussion on the system design and the voting process users experience when using Televoting.